How to Install STEELCO™ Gutter Screen on half-round gutters. 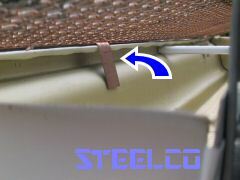 For installing STEELCO screens on half-round gutters, the drop-in method is used. However, some half-rounds have an inside lip, allowing you to choose between the standard installation method (same as K-style gutters) or the drop-in method. For half-rounds with an outside lip, use the drop-in method, as described below. Left is a brief animation showing installation on gutters with an OUTSIDE lip. Right is a brief animation showing installation on gutters with an inside lip. The is simply putting the STEELCO screen in place with the anchor clip bent perpendicular to the screen, so the clip drops down inside the gutter, as shown below (picture below is K-style gutter, but same applies to half-round). With the opposite edge of the screen under the shingles, the front edge rests on top of the gutter lip. Optionally, you may drill a hole and insert a screw, securing the screen to the gutter lip. If screws are used, one screw per section is all that is needed.